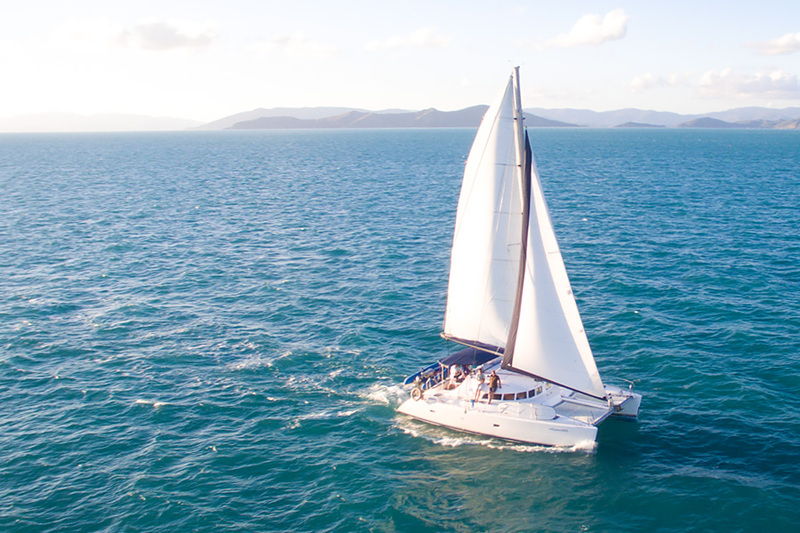 Relax on board Whitsunday Blue where you you sail around the beautiful Whitsunday Islands for the ultimate escape into paradise. With only eight passengers and two crew, you will get to experience a very personal atmosphere with the best service. You can look forward to snorkelling on colourful fringing reefs of the Great Barrier Reef, wandering the beautiful silica sand of Whitehaven Beach or enjoying some relaxing time back on board. Whitsunday Blue has stand-up paddle boards, plenty of deck space and a spacious interior to allow guests to feel completely at home while at sea. During the winter season of July to October guests may even be treated to a special sight, put on by the humpback whales who frequent the area, breaching and playing in the warm waters. 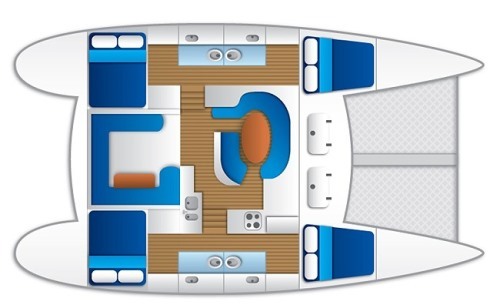 Whitsunday Blue is a very spacious vessel that has four private cabins all with ensuites. The interior saloon seats all passengers for evening meals or you can dine under the stars on the aft-deck seating area. Please note three cabins have a private ensuite and one cabin shares an ensuite with the crew, with separate entrances. Blue was constructed in 2004 and is 40 feet in length. Whitsunday Blue is designed to cater to the wishes of our guests, so you enjoy the ultimate holiday experience in the Whitsunday Islands. No two trips are the same as we take you from one idyllic island location to the next. 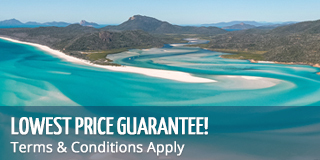 You won't be feeling blue on Whitsunday Blue! The Whitsunday Islands are one of the top holiday destinations in the world and definitely one of the top sailing destinations. It is a sailing and boating paradise with calm waters and beautiful islands to explore, with quiet anchorages for overnight stays. It's beauty will leave you in awe as your crew takes you to some of the best places the Whitsundays has to offer to snorkel, swim, relax and explore. The seemingly endless bays and coves will allow you explore at length, with each stop more picturesque than the last. Sailing, swimming and snorkelling the on the beautiful Great Barrier Reef is just a normal day in the Whitsundays. Explore Australia's national parks and spot the local wildlife, wander the pristine white sands of Whitehaven Beach or take the walk to Hill inlet lookout, the third most photographed place in Australia! World famous and incredibly beautiful, you'll find out why Whitehaven Beach attracts thousands of people to Australia every year. It is the third most photographed place in Australia, and Hill Inlet Lookout offers a view you will never forget. Your crew will take you on a short bushwalk up to the lookout, giving you some local knowledge along the way, where you'll learn some interesting history about the Whitsunday Islands. Take a break at the top where you can see the beauty of the unique swirling sands first hand. Afterwards, take a short walk down to the beach, where you can enjoy some leisure time to swim, relax, sunbathe and enjoy the stunning and soft silica sands. The Whitsunday Islands boasts some of the most marvellous and diverse corals in the world. With thousands of species to see, the magic of the underwater world is immeasurable. Accompanied by colourful fish, sea turtles, and other inquisitive sea life, you can snorkel and explore alongside your friends, family or loved one. Whether you're an experienced of first time snorkeller, your qualified crew are there to help you learn and make sure you make the most of your time in the water. Flotation devices are provided to those who want them to make sure your experience more enjoyable and comfortable. Paddleboarding is one of the newest ways from which you can explore the reef on board Whitsunday Blue. Not only is it fun but it also provides a workout and amazing views! They are great for wildlife spotting as you silently glide around the waters, keeping an eye out for turtles and other marine life, viewing the colourful reefs from above. Choose to try it out solo, or grab your partner and hop on together for a fun couples activity. We guarantee the quality of our food aboard Whitsunday Blue and we promise you won't be disappointed. Fresh fruit, cookies, tea and coffee are always available during your three days, and all dietary requirements are catered for. We ask that you please let your crew know ahead of time so they can prepare for your arrival. We are also really happy to help with special occasions, such as birthdays and anniversaries or any other special events. Brewed coffee and a selection of teas always available as well fresh fruit. Whitsunday Blue is a BYO vessel. Please feel free to bring bottles of wine and, if possible, beer in cans. Whitsunday Blue 3D/3N is also available for Private Charter. "Just got back from a fantastic three day three night sailing trip on Whitsunday Blue catamaran. The crew were Aaron and Rachel and they made us feel welcome and safe throughout the whole trip. There were only 8 people on board which was good. We went snorkelling at many different sites, saw Whitehaven Beach and tried paddle boarding. The food was very varied, tasted good and there was plenty to eat. Aaron and Rachel worked well as a team and nothing was too much trouble for them to make our trip enjoyable. Thanks again for a great trip." "Our crew, Brad and Emma, were fantastic and couldn't do enough for us. The snorkelling was awesome with Brad finding some great spots. You could easily spend the whole 3 days in the water if you wanted. Emma was a great host cooking, cleaning, playing deck hand and generally looking after us well. And Brad did an excellent job of safely navigating us around the islands." 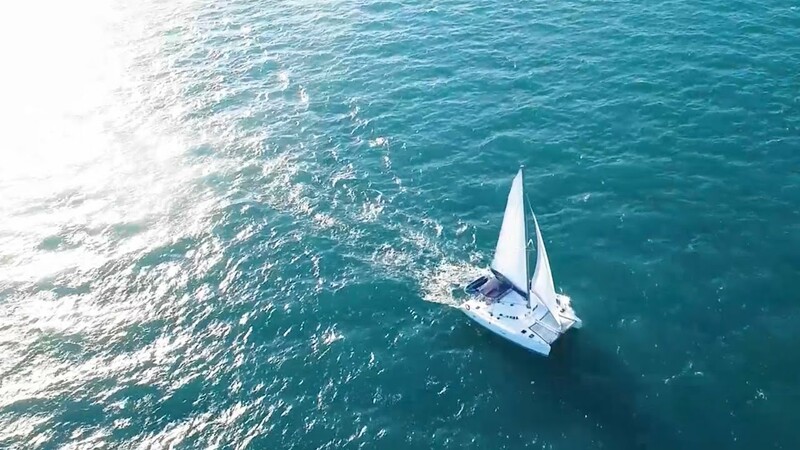 "The Whitsunday Islands are one of the most beautiful set of islands in the world, if you love to sail, snorkel, or just plan be out on the water, this is the place for you. You can spend your days sailing around the islands, each island having its own unique attractions. This trip was great!" "Wonderful experience with very informative briefs from the captain. We were looked-after very well by the crew, and would recommend to friends and family. " "Highly recommended. Greatly experienced crew, fantastic food and awesome company. Loved every bit of the adventure!" "Crew (Jas and Charlotte) were fantastic! Looked after us really well and showed us the best of the Whitsundays. Excellent beaches and snorkelling, loved the swirling sands and the aboriginal lands/stones." "Sam - very amiable and knowledgeable as to Whitsundays & snorkelling spots - Ali - great cook & 'mother' Endless supply with foods - my highlight was the barramundi and I don't eat fish. The boat is comfortable and the right size for 8 guest and 2 crew The highlight of the trip was whale sighting, snorkelling - I have been wanting to do this for years." "THE CREW - 4/5 Really liked the contact of both. Learned a lot from both, very accessible. THE FOOD - 5/5 Food was very good, we didnt think wed get that level of dinner. THE BOAT - 4/5 It was a nice boat. Rooms were perfect and had enough place. We really enjoyed it! HIGHLIGHT - The Whitsunday Beach." THE FOOD - 5/5 Fantastic! THE BOAT - 5/5 Couldn't be better! HIGHLIGHT - All of it." "THE CREW - 5/5 Both Aaron and Allie were wonderful! They were attentive to all the guests - called us by each name right from the start, made sure we were comfortable with all the activities and generally treated us like royalty. THE FOOD - 5/5 Ever meals was superb. Allies planning, prep and presentation were flawless - I need to take lesson from her. THE BOAT - 5/5 Mu first time on an overnight boat I loved the sway of the boat, the glimmer on the water. The smell of the salty ocean. The boat was fairy easy for me to get around even with my limited physical agility. HIGHLIGHT - Aarons Humour, the trampoline, visiting around meal times, snorkelling. " "The crew were very pleased professional and friendly, very knowledgeable. All the food was very well presented, plentiful and varied. The boat was 1st class. The highlight was Whitehaven sands and snorkelling. 5 out of 5"
"THE CREW - 5/5 Both ally and Aaron made us and the whole group feel very much at home. We had such an amazing trip and as out 2nd rime on Blue we shall be back again for sure! THE FOOD - 5/5 Couldn't be better - A great choice for all preferences! Well fed and well looked after. THE BOAT - 5/5 Excellent, very comfortable. HIGHLIGHT - Great scenery and the knowledge passed on by the crew. " "THE CREW - 5/5 Amazing Captain with an outstanding knowledge of everything and excellent and very attentive host. THE FOOD - 5/5 So much food and all to an excellent standard. THE BOAT - 5/5 Amazing boat and well kept. HIGHLIGHT - Snorkelling with George the wrasse. Best trip EVER!!!" "THE CREW - 5/5 Azza a great bloke, great sailor very knowledgeable on local geography, history, marine like etc. Aly extremely friendly, great cook, kept morale up, clean cabins. Both excellent customer service! THE FOOD - 5/5 Aly a very competent cook. Awesome variety, never went hungry. Only complaint was too much food! THE BOAT - 5/5 Always clean and tidy and safe. HIGHLIGHT - BLOODY BRILLIANT! Whitehaven Beach, crew awesome and great travellers with us! " "CREW - Very personal - happy to have net Aaron and Ali. FOOD - Great food - definitely didn't need as much as was served, but very good! BOAT - 5 out of 5 HIGHLIGHT - First snorkel and paddleboard. " "Best crew on the Whitsundays for sure!! Wish you all the best! Great and tasty food.. refreshing and light breakfast. Followed up by a great dinner in the evening. Enough space for everything if you wanted privacy or be social. Nice and well cleaned. Excellent ride on the water. Best boat trip in my life!!! Highlight - Albert, Elvis and sea turtles!" "Aaron & Aly were amazing. Heaps of knowledge & always there to help or answer questions. Would love to go on another trip with them in the future. Great food - amazing what can come out of that tiny kitchen. The boat very well maintained & always clean & tidy thanks to lovely Aly." "Captain - the best I've seen! So knowledgeable + skilled! Host - absolutely lovely, amazing chef!! The food - really really appreciate the effort to provide special food for me (gluten free + vegan). The food was absolutely amazing. Thanks very much. Our veggies + fruits taste lovely + fresh. Very impressed with the boat - I want one :)"
"Really relaxed atmosphere. Food cooked with love! Highlight was Allie and Dolphins." "Crew - Aaron was very knowledgably and shared his experiences with us. I felt very safe while on-board. Ali very friendly and never stopped catered us very well. Excellent trip! Food - Excellent range, well prepared was never hungry. Boat - met all our needs, suitable for journey comfortable and well stocked! Highlight - several, sunsets and snorkelling with the fish." "Aaron and Ally were very competent and made our tour a great and memorable experience. The food - plenty of it, we loved the nachos, lots of salads. " "Aaron is very knowledgeable, informative helpful and entertaining. We were very comfortable about all aspects of the boat, snorkelling and area. There was no way we could eat all the food offered, the variety was great. Ria was great, worked hard and was very attentive. " "The crew was very friendly, good fun and always making sure everyone is happy. The food was Yummy :) never go hungry!! The boat was lovely, clean and cabins were spacious for a boat." "We booked the sunset tour because we wanted 3 nights on a boat. The skipper took us to the Whitsunday Peak lookout and that along with the beach was the highlite. Absolutely loved the trip thanks to Nat for looking after us so well. The boat is very tidy and was above our expectations.."